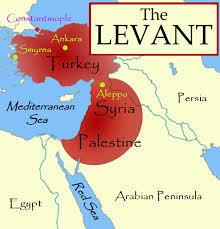 A taste of the Levant @ Ceru - What's Katie Doing? 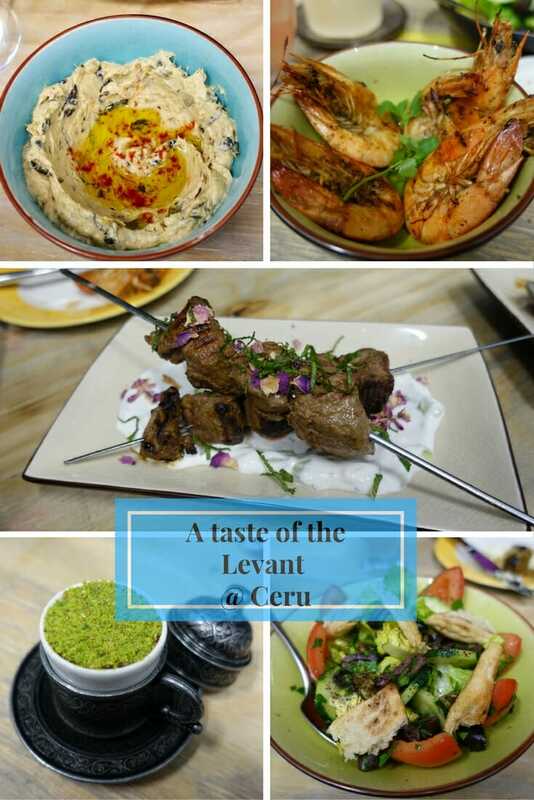 The Levant region encompasses Middle Eastern countries around the Mediterranean sea and it’s dishes from this region that Ceru focuses on. The name Ceru it’s self is short for the colour Cerulean blue, a common colour used in this region. 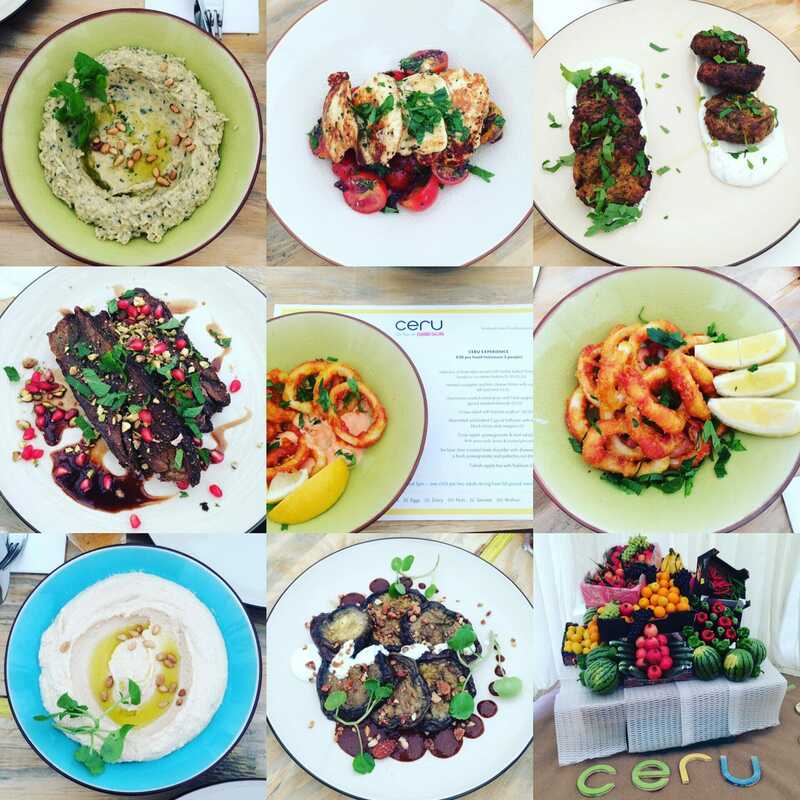 So when Ceru finally got a permanent site in South Kensington I jumped at the chance to try out the menu. A few weeks ago a group of foodies gathered in the wind and rain in an archway under Bermondsey train line. 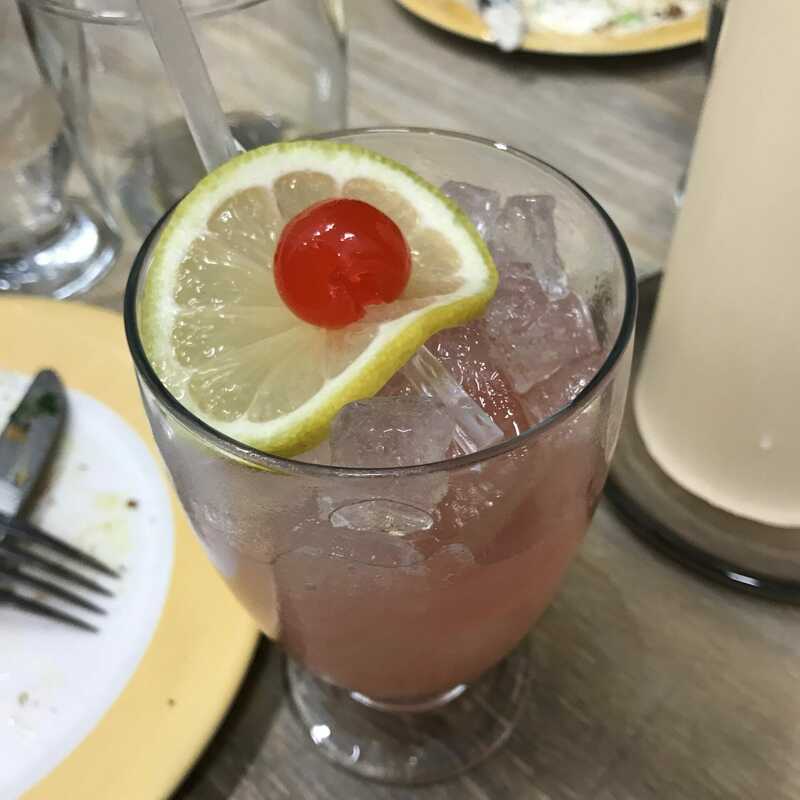 We were at Ceru’s production kitchen to try out the food and the new signature cocktails ahead of the official opening on 8th December 16. 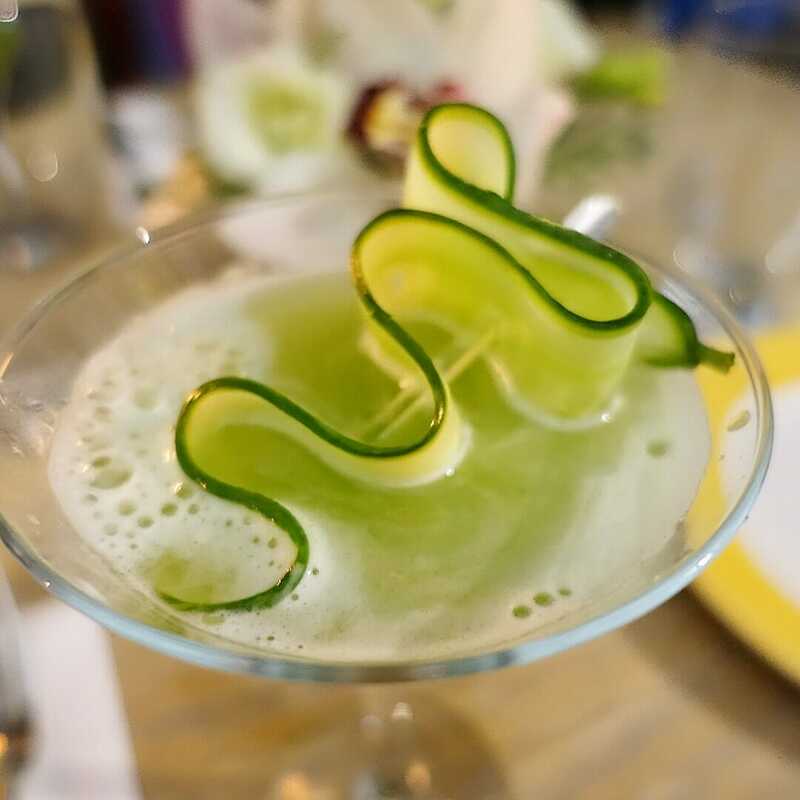 Signature gin and cucumber cocktail – the presentation is amazing! We were greeted with this lovely gin and cucumber number – a cucumber martini made with Tanqueray gin, cucumber juice and a hint of mint. Green and refreshing, it tasted positively healthy! As this was the production/test kitchen I took the opportunity to have a look around. 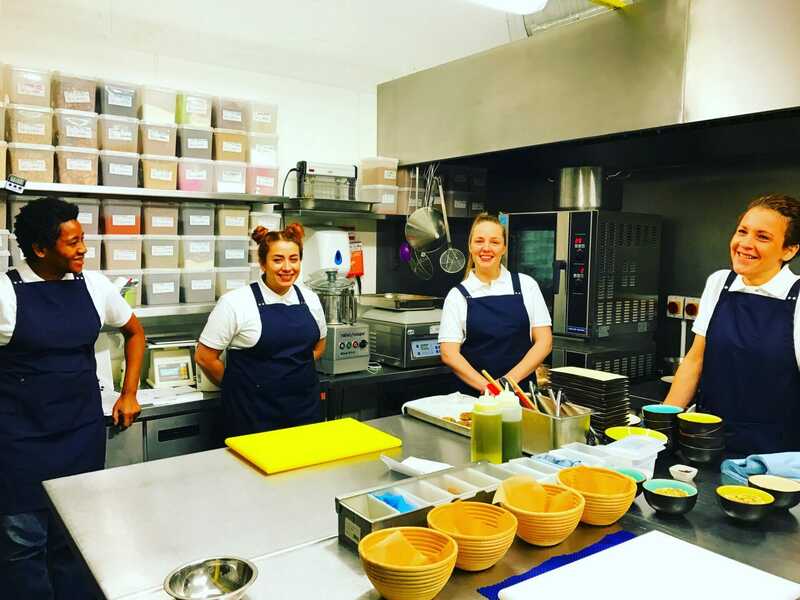 The ladies in the kitchen team in charge of our dinner tonight. The kitchen wasn’t large, but smelt great, we knew we had some treats coming later! 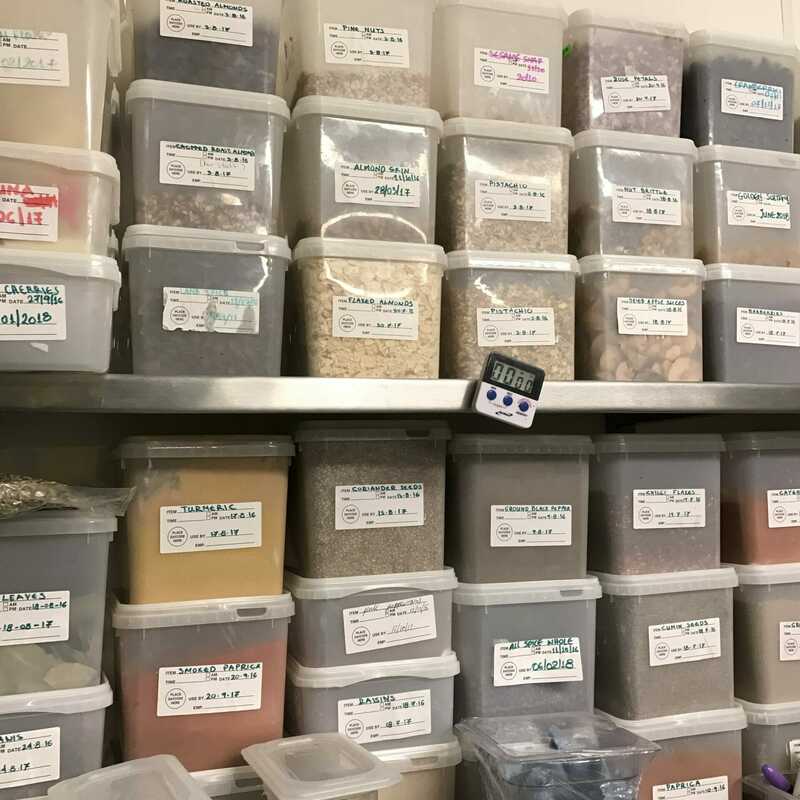 The spices are key – Ceru does an amazing slow roast lamb dishes that uses 7 different spices, and they are a big feature of middle eastern cuisine. But by now I was ready to dive into the food. 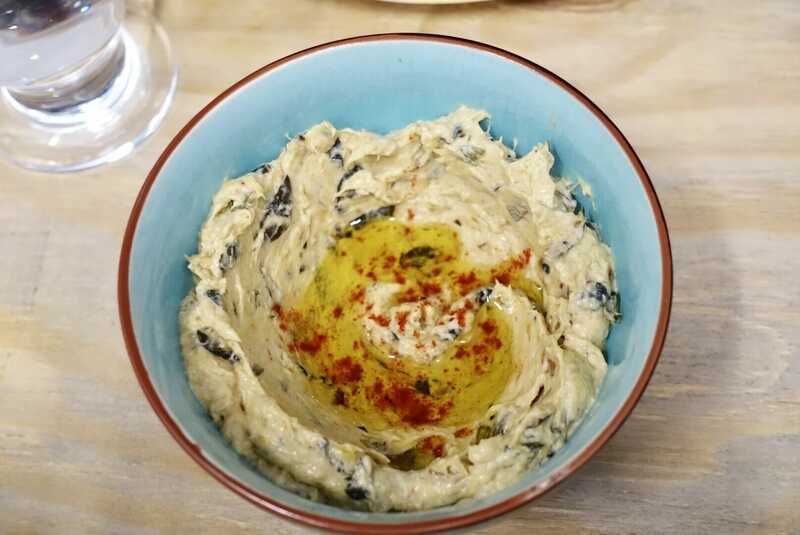 Lovely courgette dip – something different from the usual hummus that you get. 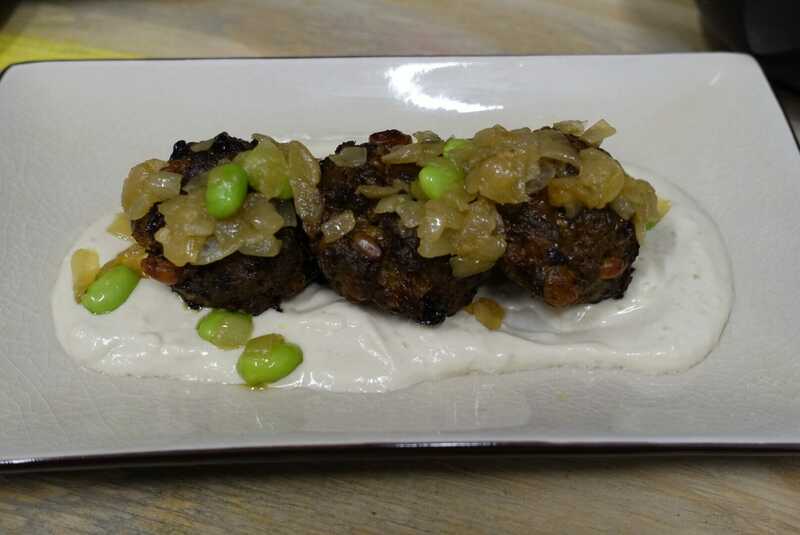 Beef kofta, made wth pine nuts and sultanas, which adds a sweetness to the meat. These were fried with beans and onions and served with a tahini yoghurt sauce. After another cocktail, we tried some of the larger/main dishes. Trouble in Paradise – a twist on a gimlet, made with elderflower cordial and a layer of Campari. 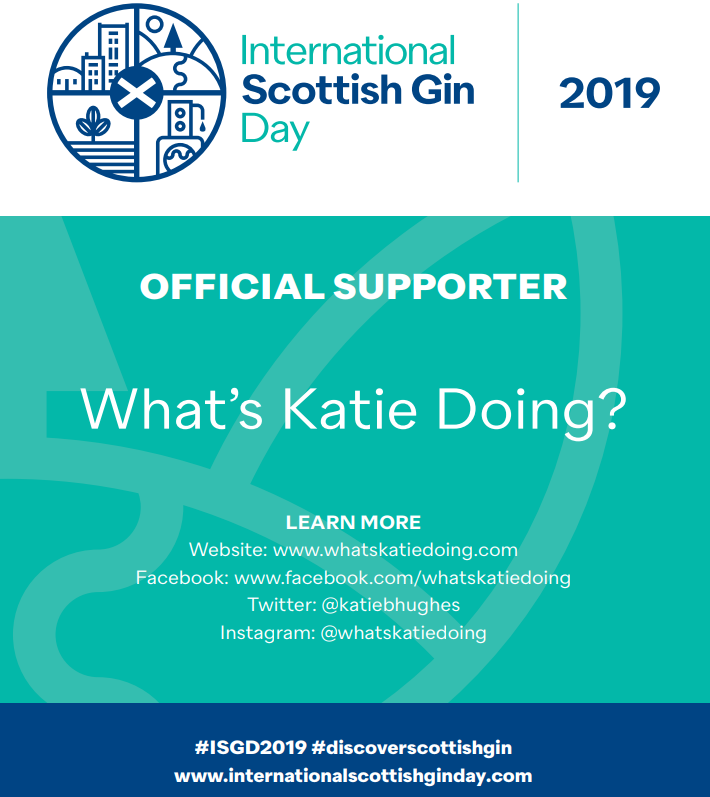 I was loving the gin focus for the classic cocktails! Michael, who had created all the signature cocktails explained that he was trying to create drinks that would go well with food as well as twist up the classic cocktails that everyone knows. This certainly worked well! 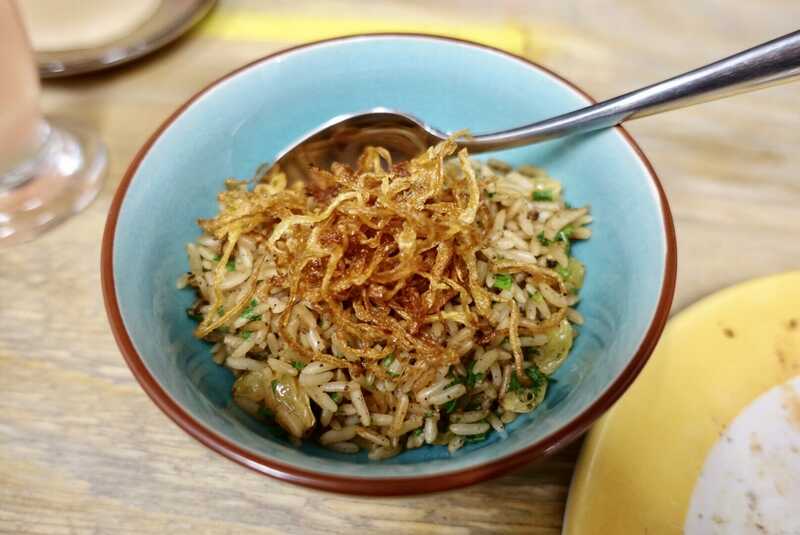 It’s not all bread, the rice dish was a welcome change to go with the meal. I eat all things so I loved trying this vegetarian dish. The roast fennel was gorgeous and the beetroot sweet and soft. 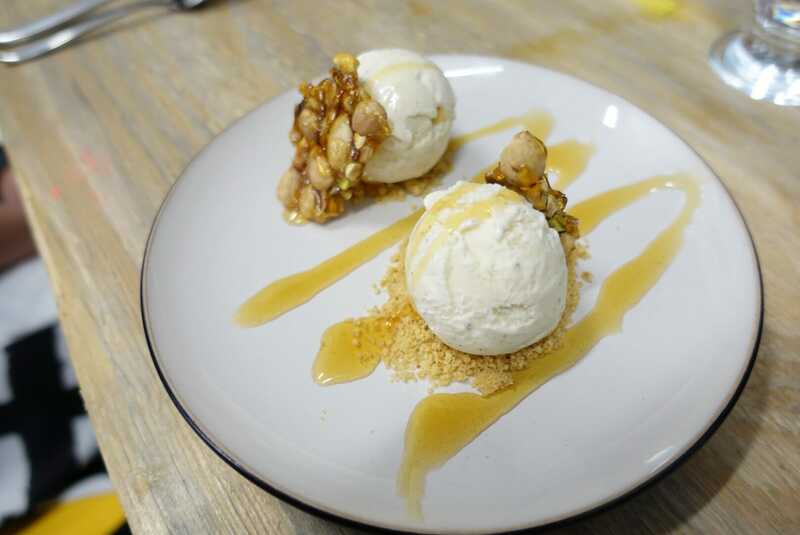 A perfect foil for the yoghurt sauce and the crunch of the roasted almonds. King prawns with lime and coriander, so tasty! 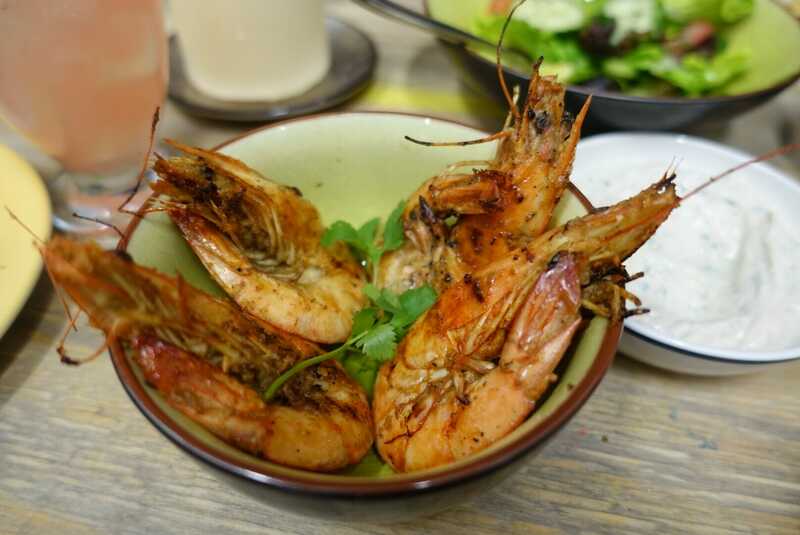 I did love these prawns – marinaded and cooked in the shell they were so flavourful, with plenty of garlic. 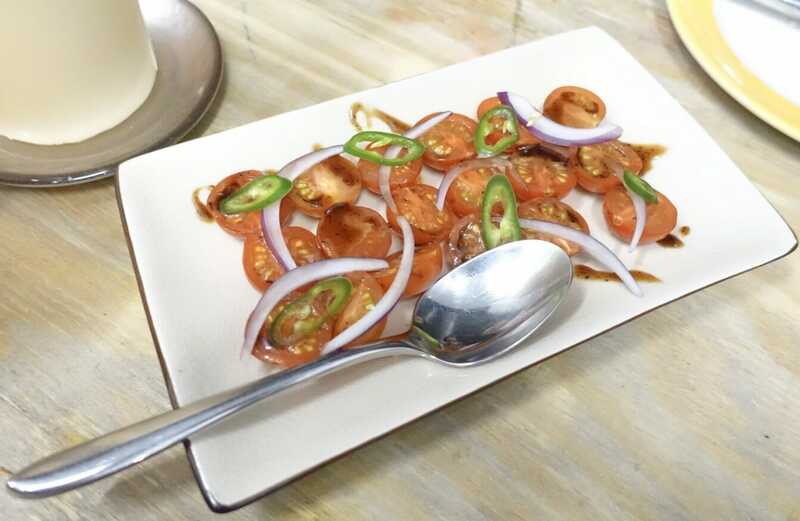 They were then dressed with fresh lime served with a coriander lahbna. 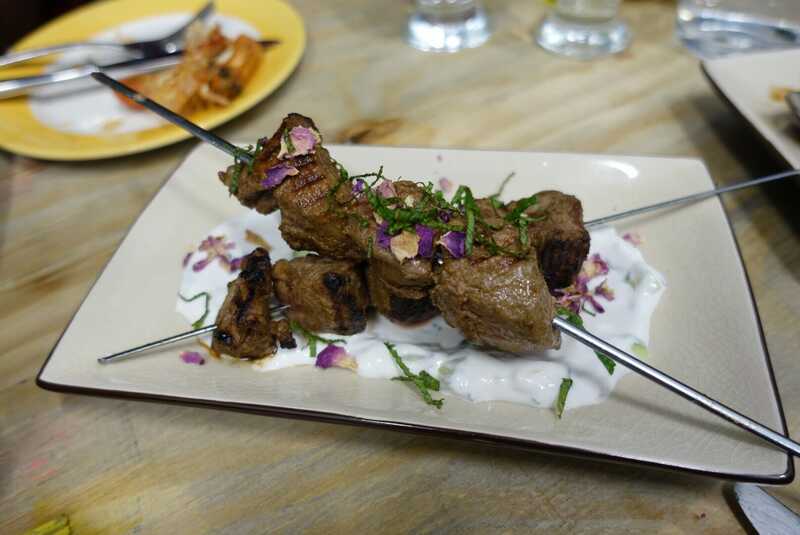 And the start of the night: lamb kebabs with rose tzaziki sauce. These were amazing! I’m not a huge fan of lamb and I did love the slow cooked lamb I tried at Standon Calling, but these skewers were perfectly cooked – pink in the middle – and tender as well as being tasty. We were the first to try this lamb dish and gave it the thumbs up! 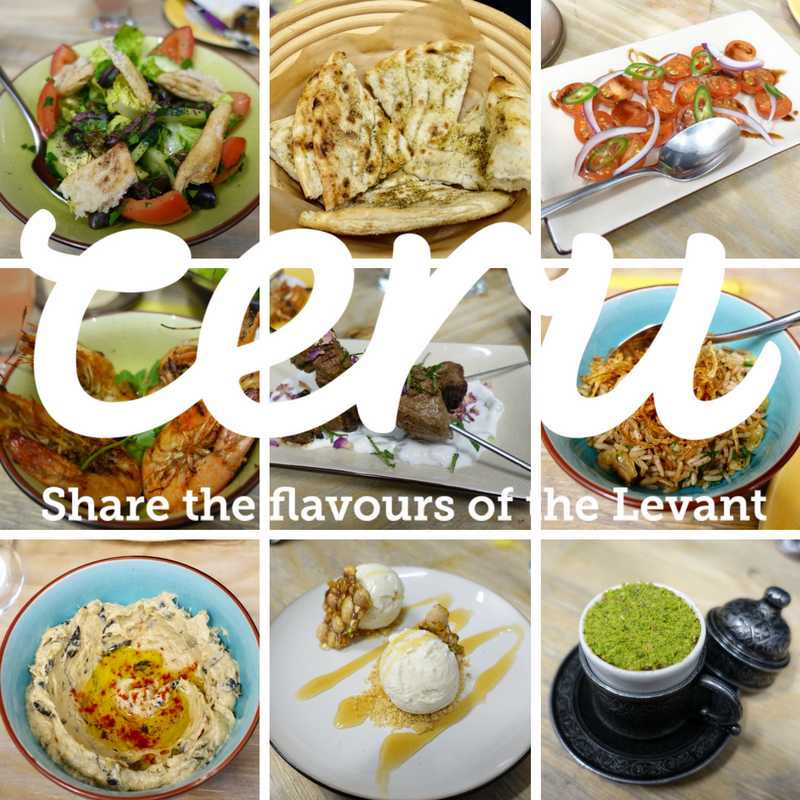 Ceru try to keep the Levantine theme running through out the menu – including the wine menu. 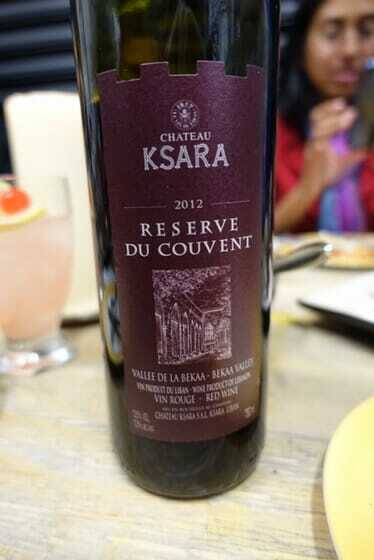 I was so happy to see Ksara wine being served with our meal! This wine is from Lebanon and I had actually visited the vineyard when I was travelling there, good times 🙂 We also tried a Greek white wine and they serve a selection of wines from around the Levant (Mediterranean / Middle East area) as well as some French wine (the French brought wine to that region, so ties in nicely!). 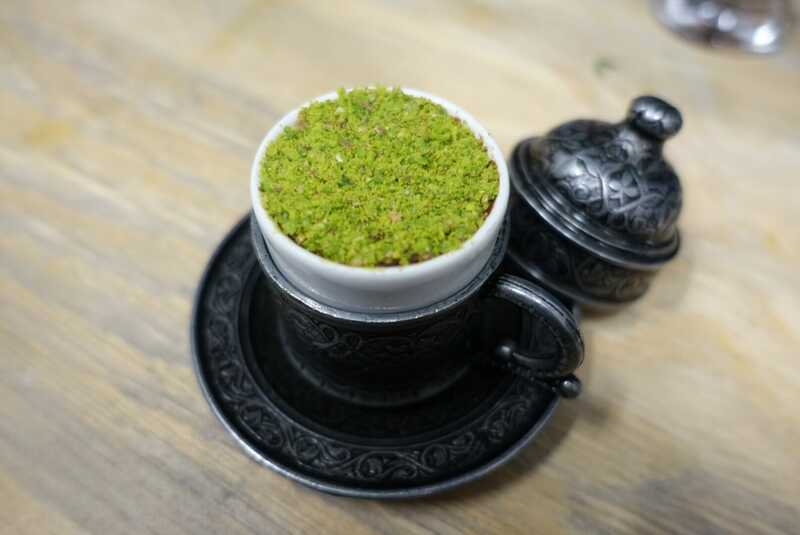 This is a little pot of surprises… go through the layer of pistachios to find the chocolate mousse… then go to the bottom of the mousse to find sour cherries! I just adore those pots with the lids! Cardamom is one of my favourite flavours so I enjoyed trying this, ice cream slips down even when you are full! So Barry and Patricia Hilton are opening their first permanent restaurant on Bute Street in South Kensington on the 8th December 16. I’d fully recommend that you head down to try it out. They will be serving food all day, from breakfast through lunch and dinner. With Barry’s background from Yalla Yalla things will be good! The restaurant has 53 covers. There are 10 seats on an outside terrace that will be warmed with car seat technology – making a seat outside an option in all weather! Inside there will be intimate booths, a large table for parties of 8-10 and some counter seats by the window. 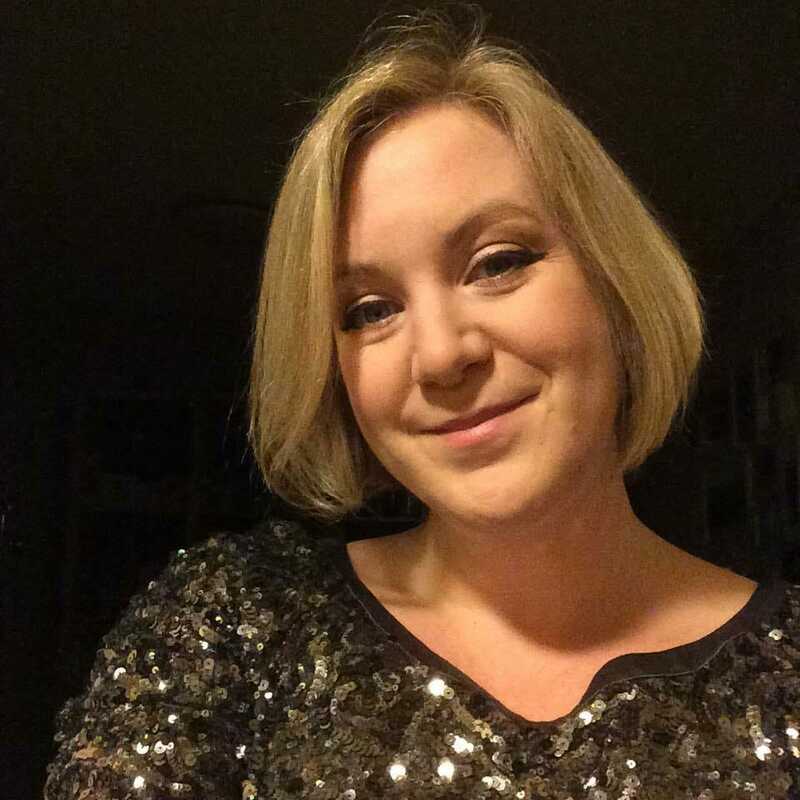 Patricia says that they will ensure that they have some tables unreserved for walk ins too. 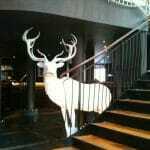 Whilst I tried out the menu and drinks for free, dinner should cost around £35 including dessert, a drink and service (all of which goes to the staff). 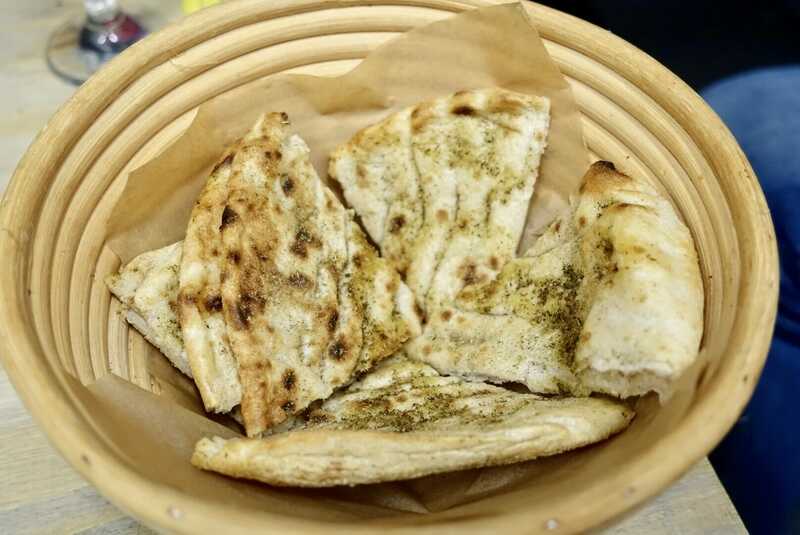 OMG Mediterranean food meets Middle Eastern food? Those are some of my favorite flavors. All of these photos are mouthwatering. I just ate lunch and looking at this made me want to eat again, except I wanted EVERYTHING you’ve shared! Also, that cucumber cocktail with gin sounds so refreshing! I am so jealous you got to experience this! I am a huge fan of hummus and would have been excited from the get-go. The cucumber martini sounds so yummy and that pistachios chocolate mousse sounds like it was amazing. Even the dish it came in was gorgeous. 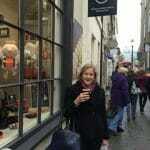 Thanks Candy – I loved that pot too! The food is really spectacular. The presentation and the colours are stunning. I loved the presentation of the cucumber slice in Gin. I am sure the food tastes as lovely as it looks. It certainly was lovely Vyjay! From pop up to restaurant, good for them. Those dishes look like a real treat. I’d definitely want to stop by there if I were to visit Kensington as well. MM mm.. the colors too, perfect for the snap happy foodie too. Another great post. Sounds great, I will definitely have to visit here. Its on my list now. Excellent, I can’t wait to visit the actual restaurant. Apparently the loos will be interesting too….?! 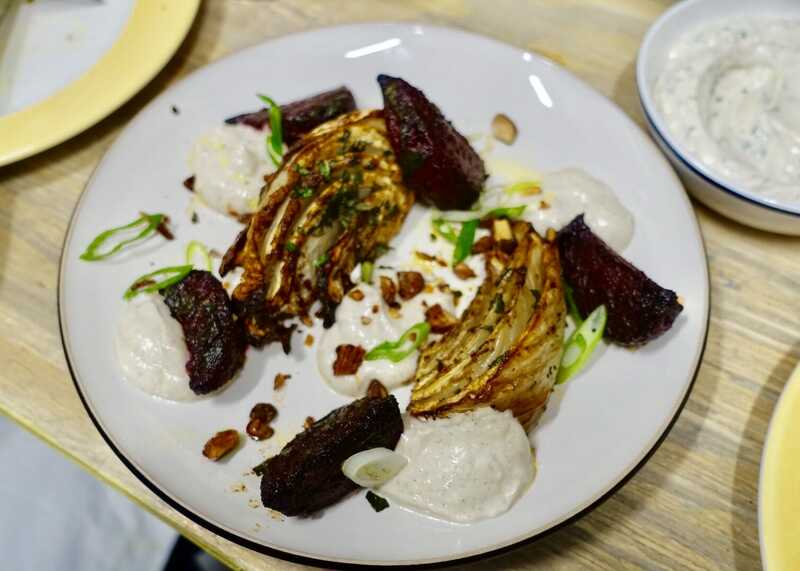 Everything looks delicious especially the roasted fennel and beetroot salad with roasted almonds and the courgette fritters – yummy! Yes those are some of my favourite seasonal flavours, I like how they add the spicing to make it more interesting Lydia. Wow, this food must be really something I should try. I have not heard and seen this kind of food before and I’m sure this is really luscious. I like how you present each one of them cause it looks to be very tempting. I also love how the food was being prepared and served. Thanks TheLittleLai – I think you’d enjoy it. Looks totally amazing. Sending this to my mother-in-law who lives in London and works near South Ken. Elderflower seems to be the flavour of the moment – looked like a very nice cocktail. Looking at planning a trip to London soon given the exchange rate is so good at the moment and know that this will be on my list for sure. I’m sure she will love it Kerri – they are open all day from breakfast through to dinner, so good even just to pop in for a quick bite at lunch! 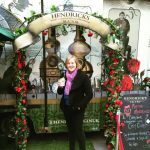 Someone was recently raving to me about the food in London, and I laughed a little bit remembering my time three ten years ago. It seems like things are really changing and London offers so many interesting cuisines now. Everything here looks amazing. I love trying new spices, as long as they aren’t too hot. I would have trouble deciding between shrimp and lamb though…maybe I just have to do both! Nothing was too spicy for me Stephanie, although I avoided the fresh chili! 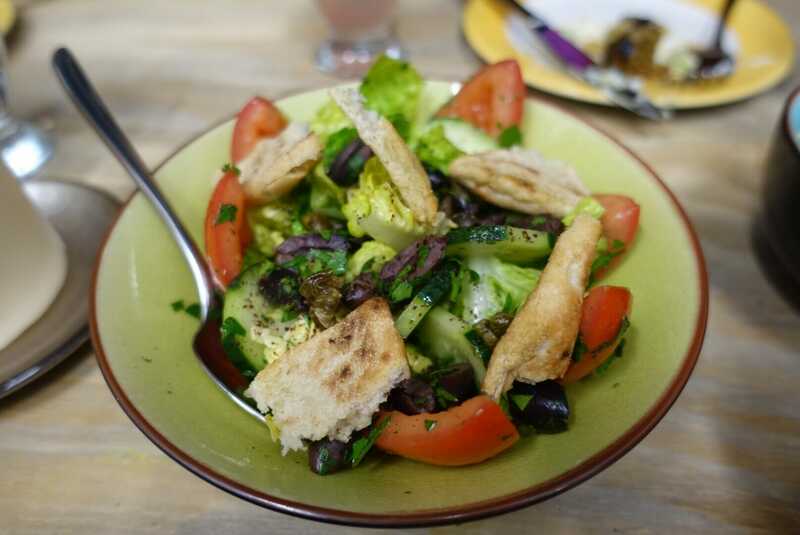 I think the London food scene is a little like New York – lots of new things and a great diversity of cuisines, as long as you stay away from the central London tourist traps! The first thing that instantly caught my eye is how absolutely stunning the food is! It’s like a work of art! That mousse sounds right up my alley! I love all of those things and I think that I would be dying for seconds on that! 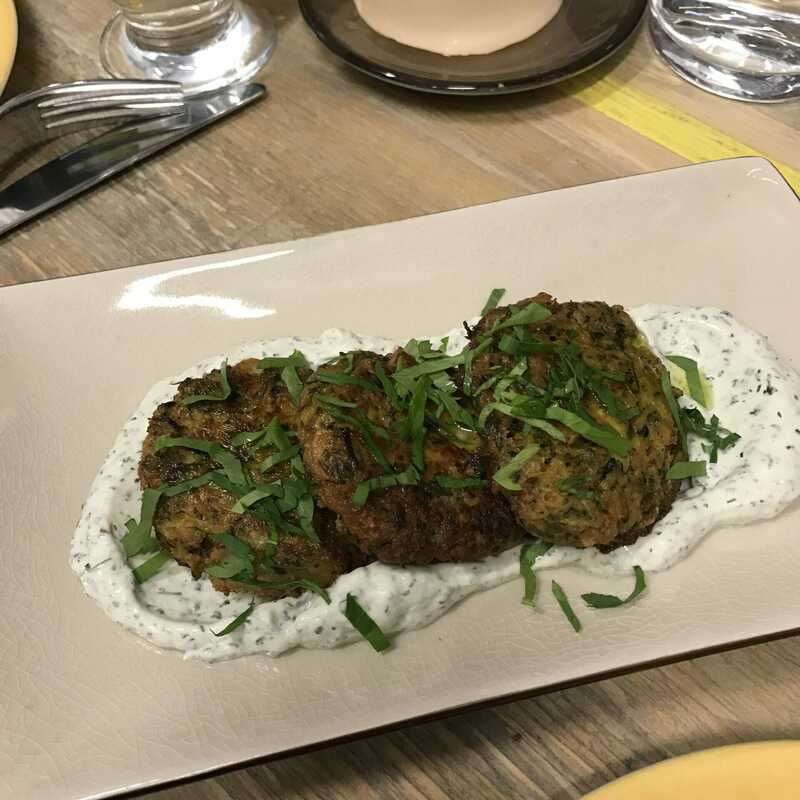 The beef kofta also looks very tasty! Cheers! It was all superb Paige, and that mousse was to die for!